Enjoy Waterfront Views, wildlife watching including birds and seals, watch sunset from your soaking tub while sipping wine. Theme bedroom sets crafted from actual boats and nautical decor throughout. Private Baths. Soaking tubs, romance showers, fireplaces, antiques, plush beds, feather pillows, cozy robes, theme quilts. Home cooked breakfast. Walk to ocean beaches, shopping, harbor, music, art studios, dining. Massage. Bikes. Take Elkhorn Slough Safari to see sea otters. Whale watching closeby. Relaxation Packages. 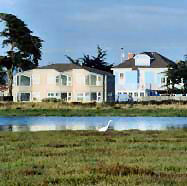 Hike or Kayak at Elkhorn Slough. Horseback rides on the beach. Near Mazda Laguna Seca raceway. Central Monterey Bay. Featured in AAA's Via magazine and Coastal Living Magazine. "Rooms are delightful, chock full of items that once functioned in the maritime world", " The room's have an expansive view of the sloughs and river, a haven for wildlife." "Creative rooms, great library, fun plans for our day, and breakfasts were tops!"